The RPO market is one of the fastest growing outsourcing markets in the world today with growth hovering above 15% consistently for the past three years. North America continues to occupy the lion’s share of the market with the UK and Australia being the other major markets. Continental Europe and Asia Pacific are emerging markets with good potential for the future. 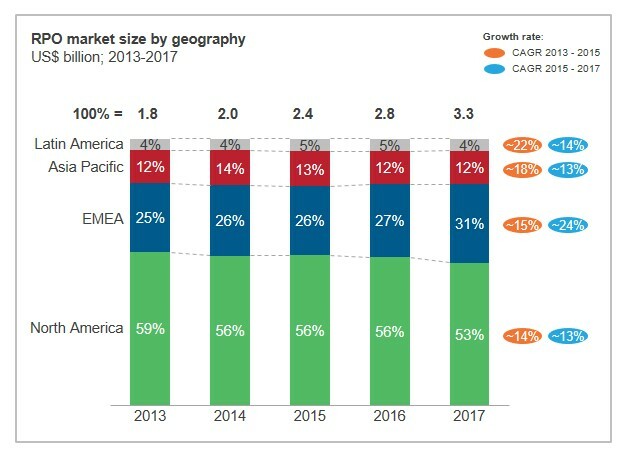 Even as the RPO market has matured in certain regions, growth has remained high due to the entry of smaller buyers as well as new industries. The competition in RPO remains intense, with not many players having a dominant market share, both in terms of number of deals as well as hires. With a large number of deals coming up for renewal in the next three years, service providers will have to be on their toes to maintain their market share as competition intensifies.